Showing results for tags 'mutilate'. Hello! 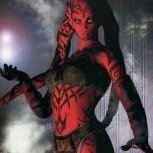 I am still finishing the armor for my Darth Talon build, but I'm already thinking about my next Twi'lek from the Dark Side. I'd like to attempt a Twi'lek with more clothing coverage to save on paint and time for short/quick troops. I've started researching the non 501st (yet) character Alema Rar after she turns to the Dark Side. My question is, she is described as "She's missing a lekku, half of one foot, one arm is atrophied and hangs at her side, her body is misshapen and lumpy... the list of injuries goes on and on." How would one even do that? Or can I keep her mutilation a little tamer? There aren't many pictures of her but the reference one I was planning on using is. Thoughts?? ?